Yesterday, there was a new movie premiered in Cinema 21 chain where its trailer had been shown since few months ago. It was a computer animated film that looked fun but not from major Hollywood production. As I mentioned in my earlier post, the Indonesian cinema chains opted to show the less blockbuster movies this week since there would be a huge superhero movie Deadpool 2 to premiere next Tuesday. Nevertheless, due to no other movies that really interest me, I decided to give this one a try. More on the movie below. Adam (Pappy Faulkner) was a teenage boy who was always being bullied in school by other students and seemed to be out of place. He lived with his single mother Shelly (Marieve Herington) as his father Dr. Harrison (Chris Parson) has passed away since he was still a baby. One day Adam found something that hinted his father might still be alive and decided to look for him by himself. To Adam's surprise, his father was not what he expected. Apparently Dr. Harrison was actually the legendary Bigfoot who had been like urban legend as no one had proved his existence. Adam had real difficulty in believing Bigfoot as his father and struggling to accept this fact. Meanwhile, Wallance Eastman (Terrence Stone) the leader of a big company called HairCo who was tracking the whereabouts of Bigfoot to collect his DNA, was able to trace him due to Adam. With his personal army, he went to Dr. Harrison & Adam's location and try to capture Bigfoot. So could Adam accept the fact he was the son of Bigfoot? And could they escape from the capture of HairCo? 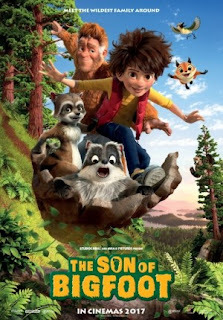 Find them all in this quite fun comedy animated movie. This movie actually had a pretty original idea. It told us the story of Bigfoot's son and his struggle to accept that fact. To my knowledge, usually movies or TV series that told about Bigfoot would be focusing only on the creature itself. The idea of making it into an animated comedy with Bigfoot having some kind of "superpower" was also quite unique and fun to see. As a comedy movie, it did provide us with few funny moments but none were so funny that would make us laughed real hard. In fact, I think the movie had more of a family drama sense rather than comedy. The first 15-20 minutes actually felt rather touching with the scene of baby Adam that was quite emotional and Adam's relationship with his mother which also made us feel sorry for Adam. Then the story's pace picked up a bit, giving more of adventure sense especially since the time we were shown the evil Wallace character, plus a more fun time when the animal characters were introduced to us. My personal favorites were Wilbur the bear (voiced by Michael Sorich) and Trapper the raccoon (Joe Ochman) who provided a lot of comic moments and color to the movie. The rest of the animal characters did not leave too much of impression to me. As a animated movie, this one really did not disappoint. I saw this not in 3D and there was no 3D category in the theater as well, but I am very sure it was made for 3D as it had many scenes that would look wonderful in such effect. The animation was very fantastic. There were a lot of scenery which were very beautifully done and the characters' movement were pretty lifelike. But I think the best part would definitely be the background animations. One thing that I was not really happy were the voice characterization. Somehow it felt like they were lacking emotions and flat, resulting to a less than satisfactory feeling watching the movie as a whole. The movie was pretty much what you would expect in such film for all ages. I think this one was quite safe for younger audience to see. Oh btw, this was not a brand new movie as it was a 2017 film which was also known as Bigfoot Junior. It was a Belgian-French production with a rather small budget and was considered a commercial hit with its box office result more than double its budget. Overall I personally think this movie was quite OK but not spectacular. It was not bad but not spectacularly beautiful or great like movies from the more experienced & richer companies such as Disney, Pixar, Dreamworks or Illumination/Universal. However, if you want to look for something different other than Avengers: Infinity War, then this could be an option. But do not expect to be so emotionally touched by this film. The choice is yours.